Think you’ve got your global social media strategy covered because you’ve nailed your Facebook, Twitter and Instagram campaigns? Well, think again, because you might not realise that there’s a huge consumer market that can’t see or interact with any of your online marketing activity. China’s middle class is expected to grow to over 500 million people by 2022, and this generation of sophisticated shoppers loves premium and quality goods. The challenge, however, is that this huge community of Chinese consumers can’t access many Western platforms, including Facebook, Google, Twitter, WhatsApp and Instagram. China has its own version of equally powerful social media platforms, and for any company serious about reaching truly global audiences, brands need to have a presence here too. The most forward thinking Western brands, including Adidas, H&M, Volkswagen, Burberry, Durex, Tangle Teezer and Starbucks, have been tackling this challenge head on by setting up brand accounts in China’s own social media platforms and learning how to engage with Chinese audiences online with exciting and engaging campaigns. China’s powerful social media ecosystem is headed up by two major social media platforms, Weibo and WeChat, who are arguably the biggest driving forces in consumer decision-making and purchase of goods and services. 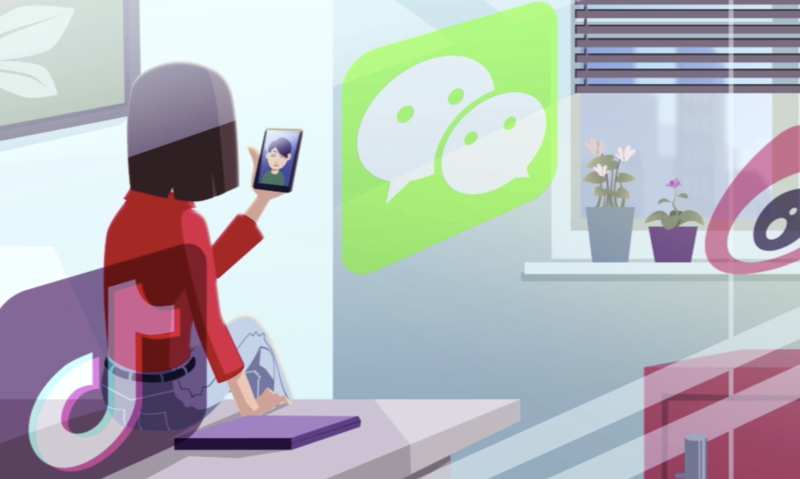 WeChat is often likened to WhatsApp because it started out as an instant messaging application, but the so-called ‘super-app’ has developed so that Chinese consumers can now use it for almost everything from sharing social media to unlocking an umbrella. Weibo started out as a Chinese version of Twitter and has over 400 million monthly active users. Today, brands on Weibo can share much longer posts and it is could be described as more like a combination of Twitter, YouTube, Facebook and Instagram. Other major social media platforms include TikTok, also known as ‘Douyin’ in China, where users can watch musical clips, shoot short clips and edit them with special effects filters, fun stickers and more (imagine YouTube, Snapchat and Musical.ly combined), and Xiaohongshu (which means Little Red Book or RED) which is more like a hybrid between Instagram and Pinterest whose audience is predominantly female. One of the biggest differences between Western social media platforms and China’s social media platforms is that Chinese consumers often purchase directly through these social media applications - a behaviour known as ‘social commerce’. While Western consumers are just starting to get their heads around using mobile phones for purchasing goods through mobile payments such as Apple Pay, Chinese consumers use mobile payments through Alipay and WeChat Pay to pay for almost everything! In a 24 hour period a Chinese consumer might use one mobile payment system to pay for anything from a taxi ride to a video game. As well as everyday purchases, Chinese consumers might use social commerce to pay for luxury goods, and are responsible for around a third of the total number of luxury sales globally. It’s this seamless link between social media activity and eCommerce that makes Chinese social media platforms such a compelling and important place for Western brands to know how to play in. It’s the reason why some of the biggest Western fashion houses are now using China’s social media platforms to launch new collections and can sell out in the same day. In the West, we’re now used to the power of online influencers and, of course, China has its own version of influencers too - known as KOLs - Key Opinion Formers. Chinese KOLs will have at least 10,000 followers and fall into three key types - the experts, celebrities and ‘Wang Hong’ which we would translate as ‘social media stars’. Working with KOLs is a great way for brands to reach specific audiences and drive brand awareness. When Adidas wanted to launch a range aimed at China’s 14 - 19 year olds they worked with one of China’s biggest KOLs to help them. Louis Vuitton and Nike have also used KOLs as part of their social media strategies in order to expand their audiences. The way brands work with KOLs is quite carefully managed and contracts are designed between the KOL and the brand. This can also help brands avoid working with fake influencers who can cause problems for brands in the West too. For any brand looking to start out with a social media strategy in China, understanding KOLs is a great starting point, with Forbes recently reporting that they should be an integral part of any marketing strategy in China to drive faster brand awareness, endorse brands and deliver more results. So - still think you’ve got your social media strategy covered? While stepping into the unknown of China’s social media platforms might seem daunting - there are many elements that mirror the Western systems that we know well. In addition, once you’ve got your head around the basics, there are now a range of consultants and specialist agencies who can help Western brands take their first steps into this exciting new landscape. To find out more about China's social media landscape, how it differs from what can be found in the West, and how eCommerce is deeply woven into its functionality, check out our brand new Social in China course.